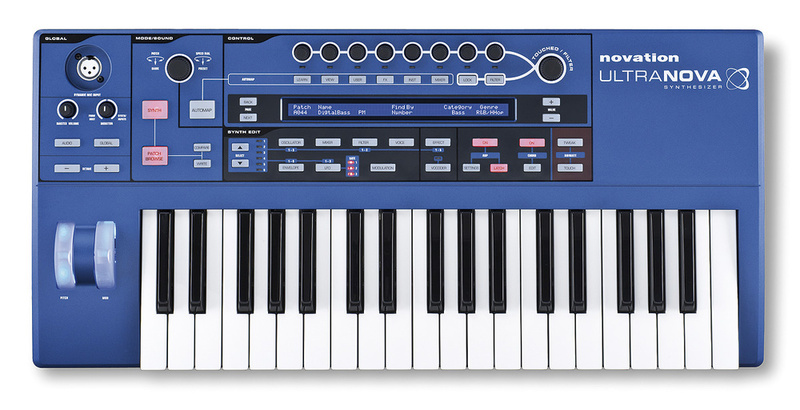 When Novation moved under the wing of Focusrite in 2004, the focus shifted, right enough — from predominantly hardware synths to keyboards and controllers often doubling as audio interfaces. Now, reclaiming a name long associated with analogue modelling, a brand‑new 'Nova' synth is born. 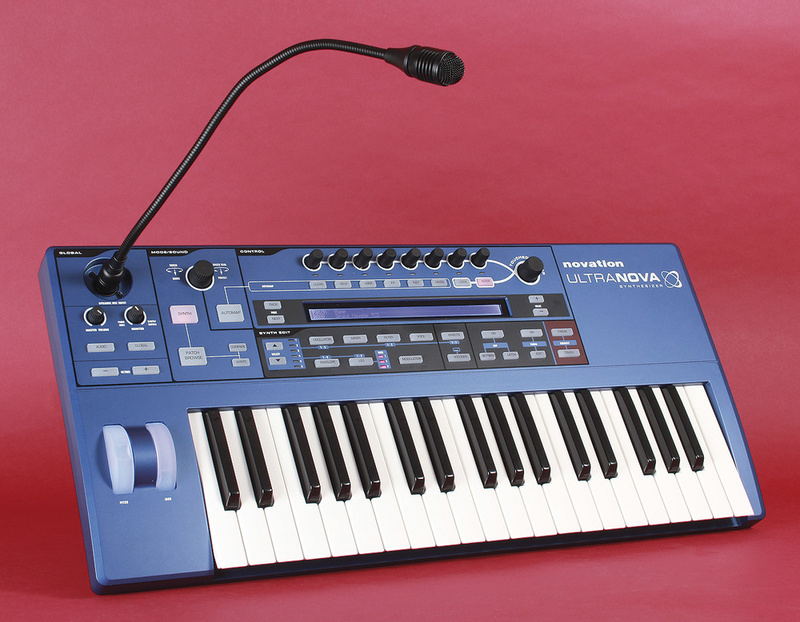 Can the Ultranova successfully smudge the lines between classic and recent Novation? It certainly tries! The UItranova is a compact virtual analogue keyboard with souped‑up oscillators, dual filters, effects and 'Touch Animation'. Adding a microphone to vocode with — or simply to yell through — it also doubles as a USB audio interface. To further sweeten the deal, it acts as an Automap controller and seamlessly slots into your Digital Audio Workstation courtesy of a software editor plug‑in. 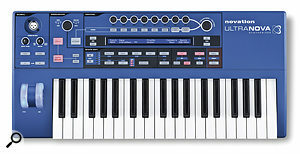 Having dallied with silver in the X‑Station and K‑series of synths, it's back to the traditional blue for the Ultranova's cute and lightweight plastic booty. Blue is also the colour of the glowing mod wheel and pitch‑bender. Backlit wheels are very much in vogue, but anyone determined to remain out of it can turn them off, or go for the 'light when used' option. The keyboard is fast and playable — three octaves of full‑sized keys responsive to both velocity and aftertouch. So often neglected, even on more expensive instruments, aftertouch can make a worthy contribution, especially on a synth brimming with modulation possibilities. Performers will also relish the included microphone, Novation's nod towards synths such as Korg's Microkorg XL and Akai's MiniAK. With generously proportioned rubber buttons for every key role, the Ultranova should prove no mystery for beginners or old hands. At the centre of operations is a row of eight rotary encoders, beneath which stretches a 2x72-character LCD showing the names and values of parameters. Each page's text is small but sharp and clear, with Back and Next buttons glowing pink when further pages are available. The encoders have a slightly notched feel, making them ideal for dialling in absolute values. Given that there are also '+' and '–' buttons for precise increments, I think I'd have preferred these encoders to be completely smooth in operation. Perhaps anticipating such wishes, Novation have fitted a higher quality, super‑smooth encoder that mirrors the action of the most recently touched pert and notchy one. During editing, you sometimes wish to keep a chosen parameter close to hand and to facilitate this, a Lock button ties the 'Touched/Filter' encoder to the current selection. This assignment is preserved even when you move to another section, and the behaviour is only cancelled by releasing the Lock button or by the adjacent Filter button. The latter overrides any allocation and places Filter 1's cutoff frequency — that most vital synth-wibbler's tool — instantly under the T/F encoder's control. Despite being a bit under-endowed in the knob department, the Ultranova's interface is both logical and consistent. Tweaking patches — or constructing them from scratch — is nearly as fast as on a synth smothered in controls. Your place within each section is always retained, while selection buttons speed up access to multiple related objects, such as oscillators, LFOs and envelopes. The Ultranova's rear panel features, from left to right, a 12V external PSU socket (although the unit can also be powered by USB), a power switch, a USB port, MIDI In, Out and Thru sockets, inputs for optional sustain and expression pedals, an S/PDIF output, a quarter‑inch headphone output, four quarter‑inch outputs (aux and master) and a pair of quarter‑inch inputs. Having come to terms with the lack of knobbage, the next shock for Novation devotees is that, unlike most synths since the Supernova, this one is monotimbral. Having become blasé about Novation's take on multitimbrality — leading the way with effects on every part — this initially felt quite wrong to me. Times change, though, and anyone requiring multiple instances of Ultranova will need to acquire the habit of recording audio versions of each. Before worrying about multiple versions, it's probably a good idea to hear what a few years out of the limelight has done to the Novation sound. First stop, the factory patches. There are four banks of these (A‑D) with 128 patches in each, Bank D being initially empty. To home in on the patch you want, spin the large Mode/Sound encoder; pushing and turning jumps to a new bank. Alternatively, press the large Patch Browse button, then let the display guide your searches. Patches are sorted numerically or alphabetically and placed in categories and/or genres. There aren't a whole lot of genres to choose from. In fact, there are just nine, including Dubstep, Jazz, Techno and Classic, this last featuring the most traditional style of synthesizer patches, some of which wouldn't be out of place on an '80s polysynth. Rather more versatile than genres, the 14 categories include SFX, Bass, Pad, String and Vocoder — all generic enough to be widely useable. Spinning through the factory sounds, I was struck by the many impressive pads that move and evolve, plus the (often dirty) basses, arpeggios and bright, analogue‑style leads. Don't panic about the last, because any cape‑twitching is kept to a minimum; the bulk of patches are contemporary in design and many are quite bright, clearly demonstrating their digital origins. Overall, apart from the pads, the selection didn't grab me as much as those on earlier Novation synths. Fortunately, everything can be overwritten and there are definitely some gems and plenty of decent 'starting points' for all things synthy. Curiously, and despite the microphone hovering perpetually under your nose, there are just eight factory vocoder patches. All I'll say is that none of them will give Korg any sleepless nights. There's just one 'External Input' example, but this is arguably sufficient. The Ultranova's simple front panel belies the complexity concealed beneath. While perusing, it's a good idea to check out the two Animate buttons, as these often inject life into limp or dull patches. Press 'Tweak' and the rotary encoders magically become eight edit parameters, cherry‑picked for mid‑performance grabbing. Having only eight to draw from certainly focuses your attention, but that's probably no bad thing. The parameter names are shown in the LCD along with the current value, so you know where you are starting from. I have certain fond memories of Samantha Fox singing 'Touch Me', but even without such an explicit invitation, the second Animate function is sure to draw you in. Press 'Touch' and the display shifts to one involving mysterious numbers and dash (‑) characters. The numbers 1‑6 represent the Ultranova's envelopes and underneath, the characters R, T or E might appear. These are rather cryptic abbreviations for Retrigger, Trigger and Enable — and they're all about a super‑flexible approach to envelope triggering. For example, you can disconnect an envelope's triggering from the keyboard and give the job to an encoder instead. Or, and my favourite trick so far, put an envelope under 'encoder‑enablement'. By choosing Envelope 2 (the filter envelope), I can touch the encoder and the keyboard triggers the envelope normally. When I take my finger away, the keyboard's connection is removed and the envelope enters its release phase, flowing through to the end. This is perfect for the kind of fluid solos so often impossible on a digital synth; indeed, this is the kind of freedom typically only available to modulars. With six envelopes to play with, complex changes and alternate note articulations are right where they should be — at your fingertips. If the modulation count (under 'M' on the display) is greater than zero, it means the encoder has been told to do something. To discover what, give the encoder a press! Programmed thoughtfully in the mod matrix, a touched encoder can simultaneously crank up the delay, shorten the decay time of the filter envelope and boost the bass. Another might shift waveforms or make subtle filter adjustments. Holding multiple encoders combines their actions — although to maintain the effect you must keep in contact, as there's no hold or latch facility. Also, it's Touch or Tweak: you are not allowed to do both at once. One last noteworthy quality of Touch Animation is its subtle built‑in slew. Having programmed several encoders to transpose an oscillator by varying amounts, I noticed that transposition didn't happen instantly. Instead, there was a quick, smooth slide to the interval. The encoders aren't velocity‑sensitive, so the rate of slide is fixed, but I found this a very musical detail that offered a fresh slant on pitch‑bending not easily replicated by a traditional wheel. The Ultranova Editor reveals all of the synth's hidden workings. Sooner or later — hopefully sooner — you'll want to dig in and tweak the factory patches, or rustle up original sounds. In doing that for the past few weeks, I've started to appreciate how the 'Ultra' label is earned. The synth-engine specs are impressive: three oscillators (all of equal power), three LFOs (and a fourth purely for vibrato), six envelopes, two filters (with a choice of 14 types for each), a chain of five effects, and a 20‑slot modulation matrix. I'd love to illuminate every nook and cranny (being a nook and cranny kind of guy), but common sense dictates a high-speed tour — with stops at the best photo opportunities. Oscillators are a traditional tour kick‑off point, and if you know previous Novation synths, you'll expect the analogue‑modelled waveforms. There's also a selection of 20 digital waves. These aren't the realistic(ish) samples of the KS4/KS5, but instead are digitally created waves, often of bright and metallic character or organ‑like, bell-ish and reminiscent of FM. Their inclusion is way more than kindness, because FM is the Ultravova's main absentee feature. By way of extra compensation, each oscillator is also supplied with wavetables — 36 of them. A Novation wavetable contains only nine possible waves, and so can't deliver the extended timbral shifts of a Waldorf or Access synth, but that doesn't reduce the fun factor by too much! An interpolation control varies the transitions between adjacent waves all the way from shifty and smooth to glitchy and abrupt. Finally, the last 'waveform' is sourced from the left or right external input, ready to take advantage of the onboard filters and effects. This decent selection of waveforms should cover most synth needs — but what else do the oscillators have to offer? For a start, each has a hidden oscillator serving up 'virtual sync'. With all three oscillators blazing, you can therefore create hellish layers of massed sync tones. Fortunately, when you need to calm things down, there's the Hardness parameter; it works like a simple low‑pass filter. Already your audio palette is like Bill Gates down a mineshaft (rich and deep), but if more fuzziness wouldn't go amiss, it's time to reach for the Density and Density Detune controls. These summon up to eight virtual oscillators — and detune them. You can apply the resulting 'Supersaw' effect to any waveform (even sync'ed ones) but be warned — this can lead to an unusual buildup of cholesterol in the ears! If you're wondering how much polyphony virtual oscillators cost, the answer is zilch, no penalty. The Ultranova is quoted as having a maximum of 20 notes to play with, although this is with effects turned off, sine wave oscillators and so on. A more realistic limit is 18 notes, and this proved more than sufficient during my testing. You can stack voices using Unison, and this does indeed chop polyphony, but Density does a similar enough (and often nicer‑sounding) job for free. Fighting the oscillators for headroom are two ring modulators and noise. With up to six audio sources, it's important to keep an eye (and ear) on their respective levels, or it can get nasty — and not in a good way. On the subject of distortion, there are many ways to stumble into the unwanted variety. Stacking voices in unison mode and then playing big chords can get you there, as can overcooking the pre‑effects gain or effects feedback. In time, as you become familiar with the complex audio path winding its way through the Ultranova, the only kind of distortion you make should be deliberate. The two filters are freely configurable in a variety of serial/parallel arrangements, with a filter balance control adjusting the levels of each. At first, 14 filter types seemed a lot, but then I realised that most are the usual low‑, band‑ and high‑pass jobs, with varying numbers of poles. The rest are combinations of different band‑pass filters. It's a slight disappointment that there is no comb filter — or more exotic ones generally — but at least the models sound good. They can be warped and transformed using distortion, too, with seven different choices, including valve, diode, bit reduction and rate reduction. Adding even a smidgen of distortion can really change a filter's response, as can 'Q Normalisation', on tap to curb the wildest excesses of resonance. I'll quickly skip past the three LFOs with their LEDs flickering cheerfully on the front panel. They do what you expect in terms of waveforms and clock synchronisation, but are spiced up by the 'quirky' extra waves of the KS4/KS5. As on that earlier instrument, several stepped or sequence‑type waves are a source of musical intervals or scales. Set the modulation depth just right and the resulting intervals add brilliant shifts, especially to pads. All LFO waveforms can be slewed — smoothed as if passing through a low‑pass filter. Six is a serious number of envelopes, especially when they have juicy extras like repeatable attack/decay phases, or triggering that may be independent of the keyboard. Although not complex or multi‑stage, you can modify the shape of the attack and decay stages or delay an envelope's start. I'm delighted to report that in mono mode these envelopes do not commit the dreaded 'start at zero' sin that lets down so many other digital synths, hard and soft. To exploit the great wealth of modulation sources, you're going to need one modulation matrix to rule them all. With 20 slots, each having dual inputs (and Touch assignment), there's no need to impose any modulation restraint at all! Dual inputs to each slot mean that the sources are multiplied — so, for example, you can use the mod wheel to fade in an LFO's action or increase the amount of reverb according to note velocity. The available modulation sources include the envelopes, LFOs (bipolar and unipolar) and controllers generally — other than the pitch‑bender, whose role is fixed. The destinations cover many effect parameters and most synth parameters — although the only modulatable envelope stage is decay. This is particularly expressive in the case of repeating envelopes, where decay time (and therefore repeat rate) can be influenced by velocity, for example. It's a pity that attack and release times are off limits for similar treatment, although Novation tell me that this is on the request list. As I began to explore the modulation possibilities, the limitations seemed somehow less important. At times, it felt as if I was programming (and hearing) an Access synth, which is no bad thing. Guided by the supplied documentation, I downloaded, then installed, the Ultranova Editor and Librarian. Frankly, if you have a reasonably up-to-date PC or Mac in your studio, you'd be crazy not to. The editor doesn't run stand‑alone — it requires a DAW host — but once running within Logic on my Mac, it behaved like any other plug‑in. This is still a hardware instrument, though, and since you only have one instance, you cannot launch the plug‑in multiple times. With large, clear graphics and tabs that divide the synth into meaningful sections, the plug‑in provides the most comprehensive picture of any patch. Graphical representations of the various digital waveforms and the visual bending of envelope curves are niceties to lure even the gnarliest beardy guy away from hardware editing. Programming the mod matrix is also way easier by mouse. Oddly, you can't rename a patch from within the editor but, instead, have to slip into the separate Librarian — a simple manager for patch banks — to do it. If you prefer to tweak patches within each song, the plug‑in keeps every nuance when the song is saved. Novation recommend the recording of editor parameter changes as DAW automation rather than MIDI data. This then appears in named automation lanes as per other plug‑ins. Designed for VST, AU or RTAS music software, the editor requires a Mac running Leopard or Snow Leopard. Windows users have a choice of Windows 7, Vista or XP (SP3). The synth and editor communicate exclusively via USB, and although this is fine for getting MIDI data in and out, Novation stress that the Ultranova is not a USB/MIDI interface. Unlike, say, their own X‑Station, it cannot be used as a means of integrating external MIDI gear. And as the editor deals in control information only — not audio — it reminds you of the necessary procedure for capturing the synth's output in your DAW. An Ultranova patch can have up to five simultaneous effects (plus auto‑pan), taken from a choice of delay, distortion, reverb, EQ, compression, Gator and chorus/phaser. Of these, most can be used multiple times. For example, you can have two delays and two reverbs, up to four instances of chorus/phaser, but just one EQ and Gator. The EQ is a three‑band affair, its frequency and boost shown on‑screen in the units 0‑127, rather than the more helpful Hz and dB. Gator is an automated 'chopper' eager to slice rhythmic holes in your source material in patterns of up to 32 steps. The effects are all useable, if a bit unadventurous. The delay is good (as always), and distortion offers the same types as the filters, adding a welcome roughness wherever deployed. The effect chain can be instantly rewired, courtesy of eight FX Slot Routings, with the results either dramatic or subtle, depending on the effects chosen. The drama can be racked up still further with the feedback control; this determines the amount of signal fed back into the chain. Lastly, there's a 12‑band vocoder, which has its own button and supplied XLR mic. I spent a while trying to improve on the factory examples, but eventually concluded that, although good to have for completeness, vocoding is probably not the Ultranova's prime directive. There's just time left to mention that, as well as the familiar set of arpeggio functions, there are 33 preset arpeggio patterns. The arpeggiator strikes the right balance between accessibility and depth, while its close companion, the Chorder, is also a nifty implementation of its type. The Chorder stores up to 10 notes for playback from a single key. Switch on the arpeggiator and — hey presto — arpeggiated chords! 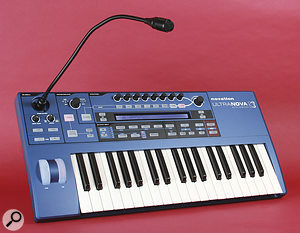 Having owned practically every Novation synth since the Bass Station, I first saw the name Ultranova as a bit provocative. It raised expectations of a machine 'beyond the Supernova', when comparisons with the X‑Station seemed closer to the mark. MIDI hardware aficionados will be surprised that a Novation synth capable of playing 18 notes is incapable of playing more than one patch at once. However, as the Supernova was pitched for the needs of its time, so the Ultranova is attuned to a brave new world of laptops and soft synths. Representing Novation's most ambitious synth engine to date, the Ultranova's oscillators, filters and modulation matrix plumb programming depths more commonly associated with Waldorf or Access. Perhaps that's why I hear more tonal parallels with the Virus than with previous members of the Nova range. There's no disguising the minimal user interface — but even the knobby Supernova demanded a fair amount of button‑pushing. And although the three‑octave keyboard won't suit everyone, the balance between portability and playability seems about right. In performance, Touch Animation is a simple idea, yet its potential is huge. Factor in aftertouch, the arpeggiator and chord memory, and this could be the most engaging small synth since Korg's Prophecy. It's getting tough to avoid computers in the studio these days, but even those who are reluctantly sucked in will concede the workflow benefits of soft synths. It follows that when a hardware synth offers DAW integration, it really does feel like the best of both worlds. When you take into account its handy audio interface and Automap capability too, the Ultranova might just prove to be an irresistible package. There aren't many comparable synths vying for your attention, but the most obvious is the far knobbier Roland Gaia SH01. With its two-channel USB audio capabilities and impressive polyphony, the Gaia is a serious contender, especially if you dislike menus and screens. 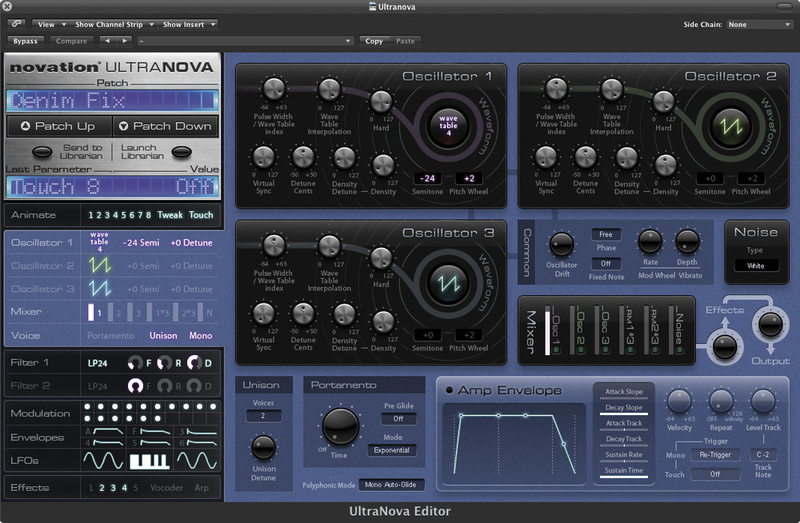 The Ultranova counters with its DAW integration and more complex synth engine, the latter inviting comparisons with Waldorf's more expensive Blofeld Keyboard. If USB audio and computers in general are off your radar, the 'Blokey' could be worth the extra cash for its multitimbrality, wild collection of filters and sample-import capability — if you can put up with the lengthy load times and don't mind an even more minimal interface! Having enthused about the Ultranova's synthy virility, it's time to consider other facets of its appeal — such as its role as a USB audio interface. Nominally, this has two inputs and four outputs; the microphone is overridden whenever a connection is made to the rear‑mounted Input 1. When using the Ultranova as an audio interface, the front‑panel Monitor control balances the outputs of the synth and any audio application, with an equal mix of the two at 12 o'clock. Should you prefer to keep these entities separate, simply route the host application to outputs three and four. In practice, this 16‑bit playback didn't feel like a major limitation — all my songs remained internally at 24‑bit, after all. You can also route a mix of the synth engine and audio inputs to the DAW input, and while this is not as versatile as, say, the Virus TI (where the instrument appears as a VSTi with a separate input device), it works well enough. And, of course, the Virus costs considerably more. Having an audio interface is a welcome bonus, and although it probably wouldn't be my main studio interface, it should definitely earn its keep in a few live rigs. I hadn't used Automap prior to this review, but when installed on my Mac, engaging Automap made the Ultranova's encoders (but not the buttons) control Logic's mixer and my installed soft synths. With Automap active, the Ultranova becomes a control surface, its synth engine only accessible from MIDI tracks of the DAW. With zero effort from me (my favourite amount), I was soon performing mixer adjustments and tweaking soft synths, the values visible on the Ultranova's screen. For more information about Automap, check out the review of Novation's Nocturn from SOS August 2008. Can be powered from USB. A tempting package of portable synth, controller and audio interface that is equally happy played stand‑alone or snugly nestling within your DAW. Focusrite Novation Inc +1 (310) 322 5500.